Julie saved that review, contacted me about her handmade clothespin bags, and sent me a sample. These clothespin bags are made of durable duck cloth to help them stand up to years of wear. They measure 13 by 11 inches, so they have plenty of room for clothespins. If you compare my old bag side by side with the Prairie Pin Pouch (old bag is on the right), you can see how much larger the new bag is. The Prairie Pin Pouch is also hard wired to stay open for easy pin access. If you look at where the hanger connects to the bag, you'll see the Prairie Pin Pouch has closed wire loops, as opposed to the original pin bag which has the hooks stuck through grommets. 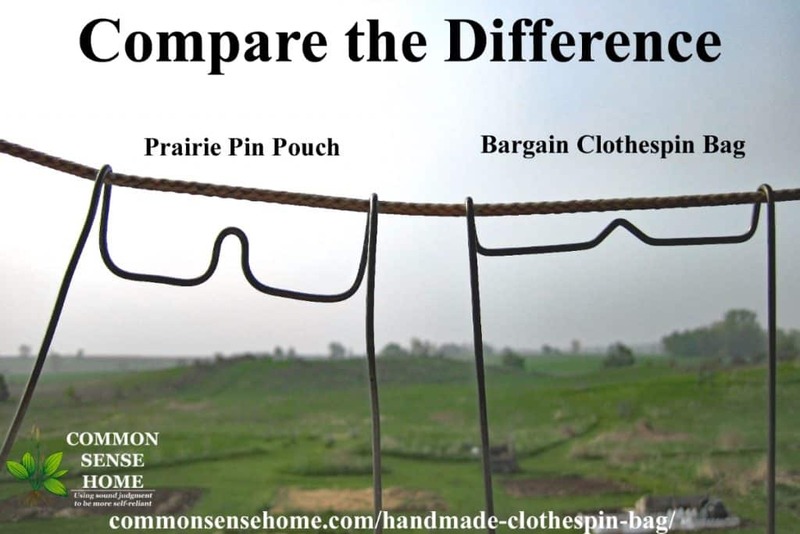 When you examine the hanger itself, you can see how much more substantial the Prairie Pin Pouch hanger is compared to the other bag. It grips the clothesline with over an inch of metal, so it's much tougher to blow this clothespin bag off. The only thing I might suggest would be to tweak the design a little to place the hook towards the back like the Original Champion Bag from 1950 shown on the PPP website. I remember my mom having one of those bags, and it wore like iron. That laundry bag lasted through six kids and roughly half a century. I suspect the Prairie Pin Pouches will hold up as well. Julie has seven different fabric options shown on the site, so you can brighten up your laundry line while you hang up your clothes. I got my Prairie Pin Pouch in 2013. Four years later and it's still holding up well. Vinegar and Baking Soda – the two best multi use items to have in your home to clean and freshen (incl laundry) EVER !!! Hanging out the laundry when I was a kid was never a chore. I loved it. My husband and I want to put up a clothesline and get back to basics more often. Hairspray on ink marks … Works wonders… Vinegar in the rinse cycle makes softer line dried clothes. What can I do about invading sugar ants? They are not cute any more, they took up residents in my brand new steaming iron that I put away high up in a hall closet, went to iron and ants just fell out of the bottom holes when I pressed my steam button, they need to get out of our house, what is the best way to rid them? Mix some borax, sugar and water together, and set it out as bait. They’ll take it back to the nest and be no more. Baking soda, vinegar and homemade orange cleaner…my favorites for cleaning EVERYTHING! Vinegar is my go to cleaner! I use On Guard concentrated cleaner (from doTERRA) for stain removal and a laundry detergent boost! Love the way it smells too. Just putting up the new clothes line, finally. Will be wonderful to be able to hang the clothes outside to dry. I love making homemade laundry soap with Fels Naptha soap.It is so easy and economical.I always hang our laundry out to dry to save electricity.The sun helps to bleach the whites and I love the smell of line dried clothes! Hanging laundry is honestly my favorite household chore. A cute bag like this only adds to the pleasure. We use orange-infused vinegar as a rinsing agent- keeps laundry smelling fresh! Received a heavy duty drying rack as a gift. Worth every penny if you are considering it. Saves on electric and easier on clothes than a dryer. I would LOVE to win this bag! I use a small plastic basket right now and it’s a pain! I’ve tried a bag like this before (like your old bag) and it always blew off the line!! Mine isn’t a helpful hint, but rather an idiosyncrasy. I guess I’m a little OCD, so I have to hang my laundry in order, large items first, matching, for instance, towels all in a line, from large to small, then washcloths, all the way down to socks. I’ve been known to repin some items because they were out of order….lol I love the look of the bags, my grandmother always made ours and the one I’ve had to buy is a joke! The bag keeps falling off the handle and landing on the ground. I have made clothespin bags from little girl denim jumpers — just sew across the bottom and hang it on a hanger on the clothesline. I do need a new one now and like the looks of the hanger on this one. Would love to give it a try!! Nothing smells better than laundry hung outside in the sunshine. We love hanging our clothes out to dry! Fresh sheets smell so good! Thanks for the entry! I have been hanging my laundry out whenever weather allows… But, the clothespin bag is always a struggle as it’s on the ground (in the basket) and I always have to stop what I’m doing to get more clothespins. I always hang my laundry to dry. During the winter months, I attached a small PVC pipe to the ceiling in my laundry and hang my clothes on hangers from the pipe. Works great and only cost about $2.50. I will be stringing a new laundry line this summer. This would make it perfect! I love my “solar clothes dryer” and definitely need something to put clothespins in. Hope I win! Add vinegar to washer to get any smells out. Thanks for the giveaway! We hang all of our clothing outside in the warmer months and on racks by the woodstove in the winter. It seems like our clothes do not wear as fast and it saves a lot of money not to use the dryer. I love hanging clothes on the line…..especially sheets….I love to sleep on freshly dried in the sun sheets!!! Oooh, we are (hopefully) about to put a clothesline in. This would be perfect. It’s so cool that the bags come with goodies 😀 I use Fels-Naptha to make my laundry detergent. I love the clothea pin bag…need. Iam usung a fabric bagged tied in a knott. What is the best kind of line to use to hang clothes? Around here (East Texas) it is humid, so we use a wire line. One of my kids tried using a cloth/rope line, and it mildewed really quick. 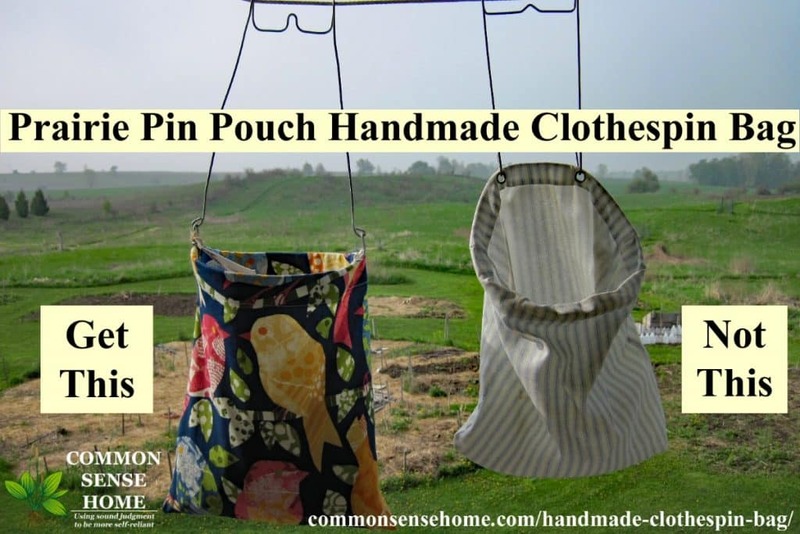 I would love to win one of these cute clothes pin bags. I would also like to know how to get smells out of jeans that have been left in a front load washing machine too long. I can get the smell out of other garments, but not jeans. Every once in a while I start a load in the afternoon and forget it until the next day. I have tried vinegar, essential oils, hydrogen peroxide, lemon juice, and still my favorite jean skirt stinks. Does anybody else have this happen with their front loader? Yes. :/ Once this front-load washer dies, I will go back to a top load. The only way I have gotten the smell out of jeans after letting them set is by hanging them to dry, then re-washing them. So it hasn’t happened often. We replaced our old front loader with an LG this year – much better. It has an easy access drain on the front with a clean out that I drain once a month to make sure no funk builds up, and an automatic drum clean cycle. The capacity on the new unit is huge, too, compared to the old one, although not the biggest available because of the space restrictions in the laundry room. Hanging diapers out in the sun to dry is the best way to naturally bleach them and keep them looking fresh! Do you have a homemade stain remover? I make my own detergent but would like to find something that would remove those tough stains. Don’t laugh, but I’ve learned the beauty of the Rainbow load! Unless I’m washing something really nice (very rare) or something that is new and I think might bleed, I don’t sort clothes anymore. It’s so much easier just to load them in as they come. We find Rainbow / Combo loads to be easier to deal with….just a few pairs of socks in any given load. Before this we always hated dealing with the White load and all it’s little bits and pieces. It’s much easier to keep the laundry moving this way. Plus we are training the kids to run their own loads when their basket is filled (Rainbow-style). Would love to win a pin bag! This is timely! I was just griping about the little bin that I use for clothes pins. I set it on the ground and get a sore back from bend, pin, repeat. nothing smells better than sun dried clothes! Vinegar in the rinse is a natural fabric softener. My mom hung clothes outside when I was a kid and I remember how they smelled. I have been reading about homesteading and saving money lately and hanging clothes outside keeps coming up. I need to just do it. What does everyone do in the winter? Dryer? hang inside? My cheaply made bag has big holes and I definitely NEED this bag! I sure could use a new laundry bag! The one I am using is falling apart because of the high winds we get where we live. I was thinking of making my own just to have a heavy duty material that you can’t find when buying them at the store. I love hanging the laundry out to dry! This bag is awesome and seems much more durable than the one I made for myself. This is a great giveaway and I would love to have a bag like this. I love to hang clothes outside. It gives me time to myself to think and pray and be with nature and just some quiet, peaceful time. Time just seems to stop when I hang up our clothes. It also gives me satisfaction as a future homemaker and wife that I am achieving my homemaking skills whilst saving our family money that can be redirected to some other bill. Money is so tight right now too. Anyways, awesome giveaway! I use vinegar and dryer balls in my dryer when I can’t hang my clothes out to dry. I finally got a clothesline again after years of living in a community that didn’t allow them. I missed the smell of sunshine on my clothes! And I agree with Mary – vinegar and baking soda are two cleaning must-haves. Best laundry tip – twice a year I throw all my towels into the machine (well, a few loads) and run it through three times: once with detergent, then again with vinegar, and a last time with baking soda. They smell FRESH, they brighten up color-wise, and the whites get white again, and no bleach! This gives me great memories of hanging wash with my grandma. Someone sent this to me recently for fresh fabric stains. A tablespoon of Dawn dish detergent, a couple tablespoons of baking soda and a couple tablespoons of hydrogen peroxide made into a paste and scrubbed into the stain with a brush. Wash as usual. I’m with Mary, vinegar and baking soda are amazing! Hi!, I find if I hang the pants upside down legs on top and put one let on one line and the other leg on the return line the winds goes thru it better and drys faster. Mine is a question: How to get black scuff marks off of terazzo without harsh chemicals – I would love to know this! One idea on the scuff marks (you may want to test on a very small area first): Apply two to four drops of tea-tree oil to the spots. Wipe excess oil with a cloth and rub in distilled white vinegar. Ohhh!!! I really need one of these! I love to sleep on sheets that have been dried on my clothesline. No fabric softener can compare with fresh air and sunshine. I hang my clothes on the line as often as I can. Bad weather is the only thing that causes me to use my dryer. Air dried sheets are wonderful. I love hanging our our laundry, there is just something so comforting in putting on a piece of clothing that has been dried in the fresh air. I already have 2 of Julie’s pin pouches, I absolutely love them, she made a special camo one for me. It’s my favorite. My laundry hanging tip is to hang everything so the openings – fronts of button-up shirts, snap/zipper side of jeans and pants, etc. – are facing the wind. The breeze will blow through the garments, opening the arm and leg holes, drying them faster and with less wrinkles. I actually hang all of our clothes up to dry throughout the year and have just been thinking about making a big to carry along my pins, as opposed to using a zip-loc. I would like to thank Laurie for her wonderful review… I sent an “extra” pin pouch for her to give to a friend…It’s great that it’s become a “givaway” I wish EVERYONE could win… I love making these little bags and I appreciate everyone’s enthusiasm…along with their “helpful” laundry tips! If by chance you don’t win the bag and would still like to have one, I would be happy to make one for you. I have several other fabrics available that aren’t on my Prairie Pin Pouch web-site,more pictures will be forthcoming…You are the people that I KNEW were out there, and I thank Laurie for helping me find you. The people that still love to hang- out clothes from a “simpler” time….Thanks, Julie Pruett! One of the things I was excited about with our new country house was that there was a pair of OLD metal cross bars set up for laundry. One of our first projects here was stringing up new line! I was all our clothes and even cloth diapers in cold….everyone thinks I’m crazy, but it does the job and saves the water heater! I can’t wait every year till warm weather hits. I’ve always hung clothes and love the smell of line dried linens. My favorite method for removing spots (it works most of the time) is to pour peroxide on the spot and then rub vigorously with a bar of IVORY soap. Let it set for a few hours or more then wash as usual in a cold water wash..
Hey homesteaders! Since ya’ll are hanging clothes dry I thought I’d leave a little tip to make your laundry days a little bit better in the winter! By soaking your wooden clothespins once a year in a brine solution..it keeps your clothespins working great and keeps them from freezing to the line! ** My sister Julie is the one who makes these bags and they are a labor of love! Everything she’s made me through the years has held up well plus is super cute! (hi Sis!) This was my first visit to commonsense home & I’m glad I found you guys! Thanks! I just recently started hanging clothes out, mostly diapers right now because I still can’t get used to the scratchiness of line-dried clothes. But my pin bag is *always* falling off! Plus hers are just prettier! Use a tennis ball to fluff up blankets, vests, pillows, etc. Wow, this clothespin bag is what I need to stand up to the Wyoming winds! I still have one from the 50’s. Bag is currently being replaced. Nothing compares to these and the Prairie Pin Pouch!! Fresh laundry hanging on a clothes line, definitely a clothes pin bag is needed for the chore filled with wooden clothes pins. Too cool! Leave cloth diapers soaking in 20 mule team borax and water until ready to wash. Removes stains very well. Always do a double rinse and hang on the line. They always smell so sweet! I am just about to set up my first laundry line! This would be so awesome! My tip is (as I used it today and it worked!!) to mix a half and half spray bottle of Pinesol and water to spray on the walls of my barn/coop to keep away flies!! This year, for the first time in many years, I finally have a clothesline! I would surely love to win this sturdy bag! I mix my homemade powdered detergent with a bit of water to make a paste, then smear on any stains and let set for a while before putting them in the laundry. Works as well as any stain remover! peroxide is a great stain remover. I have an umbrella style clothesline I have on the lot line that I share with my neighbor. I have a clothespin bag that used to be my grandmothers and has been in use for 70 plus years. I would love to win one to share with my neighbor with whom I share my clothesline! What a wonderful contest! The sun is a great disinfectant for your clothes – one good reason to use a clothesline! An overnight soak in Oxyclean gets out most stains and whitens and brightens. As sewing is not my forte this would have been a great contest to win. On another note, living on a hill it is always windy and the clothes pins snap right off the line! Grrr. Where do I find quality pins that won’t give way, break apart and leave my sheets in the corn field! I’ve looked everywhere. I’ve looked everywhere, too. The most promising ones I saw were in Australia. For now, I just extra pins, and avoid hanging above a certain velocity. We just moved out to the country and I would like to build a clothesline. Do you have plans building a clothesline? My husband works on power lines, and he brought home some old power poles and cross arms. He cut the poles to about 10 foot, buried about 3 1/2 feet into the ground, and then anchored them (just like a power line is anchored). He then used the cross arms on top, and we have wire lines. It has lasted for about 12 years so far, with no signs of coming down and sagging. 🙂 My Daddy used 2 inch pipe to build Mama’s many, many years ago. I love hanging wash. I hang out almost everything. In the winter I hang alot of clothes in the basement, as I have four pull-out lines in the laundry room. 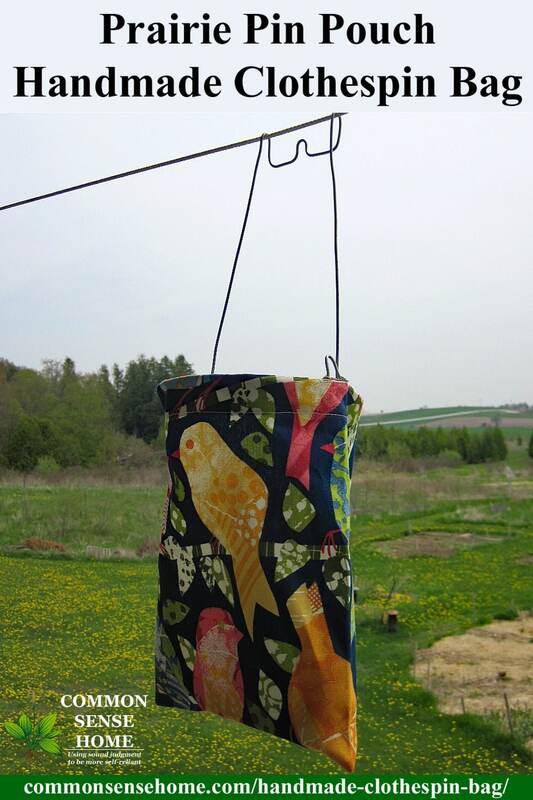 I would love to win the Prairie Pin Pouch Handmade Clothespin Bag, as the one I am currently using is torn. I just love to watch the clothes blowing in the breeze and they smell so fresh. Not many of my neighbors hand out wash, but there are a couple, bless their hearts. Hermine, the giveaway ended a while ago, but Julie still has the bags available for sale at her online shop. There is something soothing about watching the clothes swaying in the wind, isn’t there? 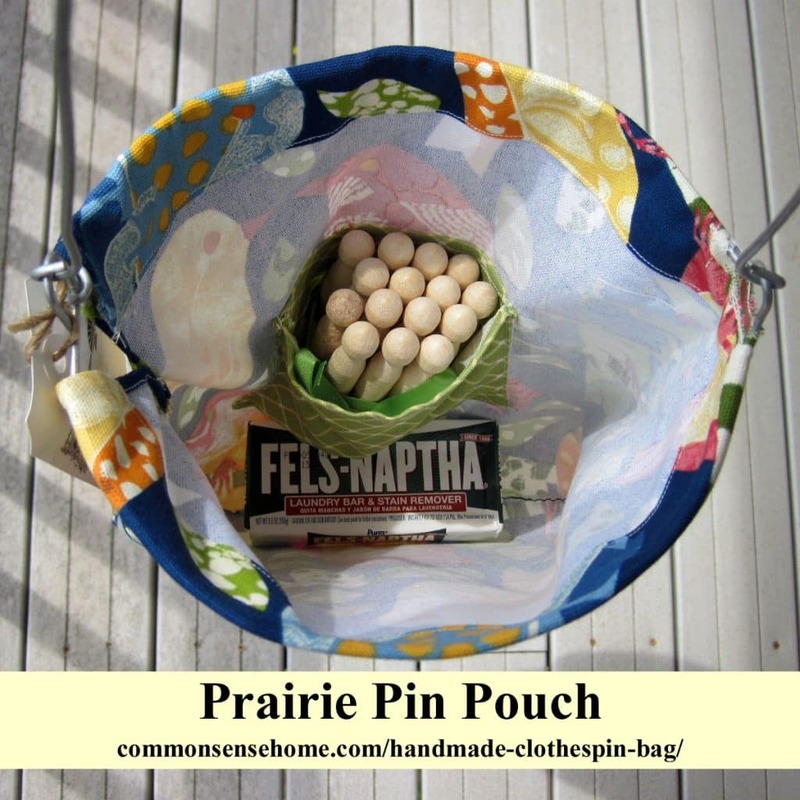 I would really love to win the lovely Prairie Pin Pouch. Hanging wash is good exercise & you get fresh air. I save energy dollars, am kind to the earth & my clothes have the fresh air smell from flying in the breeze. I hang wash outside weather permitting. In winter & when it is raining I hang wash in my basement laundry room, as I have four retractable lines. My mother hung her wash outside all year round, as there were no clothes dryers. God Bless You! I just discovered this darling clothespin bag. Kuddos to Ms. Pruett! I don’t have the ability to hang out laundry but I can think of several uses for several of these in my sewing room. They could easily hold current projects or smaller cuts of fabric I can’t bear to throw out! I love it when an old products find new uses and updated looks. I love the bird fabric. Again, way to go Julie. Thanks for making these avaiilable.